The past few years have witnessed rapid developments in two seemingly unrelated areas of research and practice: neuroscience and digital marketing. Yet new understandings of brain functioning have important (and fast evolving) implications for how we approach the ethics of marketing to children in the age of Web 2.0 and Web 3.0. 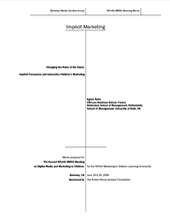 This memo examines the phenomenon of implicit persuasion and suggests that its discovery requires a radical revision of our conceptualization of "fair" marketing to children. The legal and policy implications are profound and far reaching. When is it fair to advertise to children? The theoretical underpinnings of the dominant "persuasion knowledge" model lie in the field of developmental cognitive psychology and specifically the work of Jean Piaget (1896-1980) during the 1960s.5 He proposed an age-stage model of childhood cognitive and social development in which the child's mental and interactive capacities evolve in a linear fashion through a set of biologically predetermined stages. This view is now thoroughly entrenched in the marketing canon in no small part due to Deborah Roedder John's (1999)6 comprehensive and now seminal review of 25 years of children's consumer socialization literature. Affirming the developmentalist view of the child's competence Vis-à-vis commercial communications, she suggests a three-stage consumer socialization process for children: a "perceptual " stage from age 3-7; an "analytic" stage from 7-11; and a "reflective" stage from 11-16. Today, marketers and policy makers alike tend to make an almost unquestioning assumption that children have acquired "cognitive defense" by the early years of the reflective stage, which roughly corresponds to entry into high school or senior school. This is reflected across regulatory initiatives. For example, COPPA (Children's Online Privacy and Protection Act) defines a child as under 13 and Coca-Cola and Cadbury cite cognitive defense to justify their claims that they do not target children below the age of 12. There is a neat logic to this thinking: cognitive capacity protects against advertising; children gradually develop cognitive capacity in the approach to the teenage years; by around 13 it's in place and it is therefore fair to advertise to young people above this age. However, it is worth noting that pinning down the "magic age" has always been rather problematic and it is a somewhat moveable feast. In the UK for example the communications regulator, Ofcom, recently banned advertising of food products high in salt, sugar or fat (HSSF) in TV programs "of particular appeal to children under the age of 16." Meanwhile, although the Advertising Standards Authority Code on Advertising Practice (CAP) generally considers a child as under 16 (www.cap.org.uk) some of the new provisions in the Code for HSSF food advertising apply only to pre-school and primary school children (age 0-11) e.g. Section 7.2.4 on the use of licensed characters and celebrities. So when do children cease to be children in policy terms and when should we consider them to have age related protection from persuasion? Why do ages differ across countries and for different marketing techniques within the same country? The age-stage cognitive development model is certainly not without its problems in its application to advertising regulation. This presents a serious challenge for the current regulatory frameworks in the UK and USA which assume at their core that it is "fair" to advertise to children with a certain level of age-related cognitive competence. Applications of findings from the brain sciences to communications research may be able to shed some light on this situation.14,15,16,17 A growing body of research is showing that across the marketing research field the focus on cognitive models of persuasion has led researchers to miss part of the picture. As we shall see later in this paper this part of the picture is particularly important when it comes to digital marketing practice. Whilst a number of dual process models have been applied in different areas of consumer research the attitude model is believed to offer the best account of the effects of contemporary advertising practices on children.16,17 "Implicit attitudes" are formed rapidly and automatically in response to associations which are activated when people encounter a particular stimulus.23 These associations are thought to develop through the preconscious and automatic strengthening of associations between concepts over the course of a number of experiences, in a way that "reflects correlations between aspects of the environment and cognitive, affective, or motor reactions. "24(pg223) Thus when a child (of whatever age) sees marketing for Shrek yogurt, associations with the film, the character and even the event of going to the cinema with friends are automatically triggered creating a positive attitude towards the yogurt which, importantly, will be reinforced with every similar marketing message received. This positive attitude will be formed regardless of whether or not the child understands or is even skeptical about commercial methods of persuasion. The term "implicit persuasion" has been introduced16 to describe marketing-induced implicit consumer attitude change. In line with neuroscientific evidence a solid body of research confirms that implicit persuasion can occur even if the subject claims that their opinion of a product or an issue has not changed. For example Czyzewka and Ginsburg (2007)25 found that anti-marijuana public service announcements made implicit attitudes more negative to the drug but not explicit attitudes. Gibson (2008)26 found that pairing Coke and Pepsi logos with positive or negative images and words brought about implicit attitude change in people who consciously articulated no strong brand preference. Implicit persuasion does not, therefore, necessarily take place as either a consequence or a precursor of explicit persuasion (as is often assumed in traditional marketing models)it is simply, but importantly, a separate process. Let us return to the persuasion knowledge framework and reconsider the notion of "cognitive defense" in the light of our knowledge of implicit persuasion. The question for policy makers must now be not at what age is cognitive defense in place but whether and in what circumstances children are persuaded without their conscious knowledge. As we know that implicit persuasion is largely stimulus-driven, it may make sense to begin the enquiry by examining the marketing stimuli to which contemporary children are exposed. The advertising and marketing landscape has changed dramatically since the Piagetian model of children's cognitive development was first applied to the advertising ethics debate. Wright et al. (2005)27 note that the vast majority of developmental studies on children and advertising were carried out during a 15-year period from the early 1970s to the late 1980s28,29,30,31, an observation supported by Moore (2004)32, who notes that significantly less research has been carried out since the late 1980s. Advertising during that period consisted mainly of 30-second TV spots, which were mainly factual or propositional in content. However, the nature, diversity and sheer volume of marketing activity directed at children has changed substantially since this time. The extent of this has been highlighted already in this forum33,34, and elsewhere35,36, and will not be elaborated on here. However, three features of digital and interactive marketing techniques are important in relation to the triggering of implicit persuasion mechanisms. First, it is often not clear to children what is designed to persuade and what is designed to entertain. Unlike a TV commercial which is predictably placed around and during program content, digital marketing is often not identifiable as such (e.g. advergames, product placements, viral messages and social networking skins). Secondly, it is common in interactive techniques that the product or brand is linked with rewarding stimuli (e.g. emotional rewards in advergames or more concrete rewards in the Coke Zone). Third, in the interactive environment children's repeated exposure to the stimuli is effectively limitless. Given what we know about implicit persuasion in adults it is highly likely that the engaging nature of contemporary interactive marketing which is hard to consciously identify, associated with rewarding stimuli and frequently repeated will automatically elicit implicit persuasion and discourage the deployment of cognitive resource. The key question for defining fair marketing to children then becomes whether children can control for implicit persuasion. Research in social cognitive psychology shows that adults can, to some extent, control for implicit persuasion. However it is also clear that this control is less likely to be exerted when the subject has fewer cognitive resources to devote to the task (i.e. is tired or under time pressure) or has little motivation to deploy cognitive resources (i.e. has no reason to believe that implicit persuasion is taking place).37,38,39,40,41 No research has so far been conducted on the ability of children (of different ages) to override implicit persuasion but it seems reasonable to assume that the processes in children will be similar to adults, namely that implicit processing will take precedence in "low control" situations. Which begs the question: what constitutes a "low control" situation for children and young people? It might be tempting to assume that the deployment of control resources is an age related phenomenon with younger children gradually acquiring greater control over implicit processes much like the age-stage model. However, important new brain research including neuroimaging data3,1,42 suggests that during the teen years developments in mental control mechanisms become seriously disrupted. We now know that substantial growth, change and fine tuning of the neural circuitry underpinning cognitive control occurs between adolescence and adulthood. Steinberg4,1,44 and others have suggested that the onset of puberty is associated with an enhanced responsiveness to rewarding stimuli, including socio-emotional stimuli, in the absence of any corresponding rapid enhancement of cognitive control capacities. While the amygdala (where implicit processing seems to occur) increases dramatically in volume, the neurological links between the amygdala and the dorsolateral prefrontal cortex (where impulses can be inhibited) remain underdeveloped until adulthood. What is known as "executive functioning" is much less developed in teenagers than we had previously thought. Thus, despite much greater capacity for strategic, abstract and critical thought in addition to greater experience of the commercial world, it seems that teenagers may actually (neurologically) have less control over implicit processes triggered by interactive advertising than, say, 10 year olds. Dramatic changes in the dopamine system during adolescence are also likely to affect levels of control over implicitly processed digital marketing messages. This brain chemical is responsible for what Pechmann et al. (2005)2 refer to as "'stamping in' stimulus-reward and response-reward associations" (p. 203) - a key part of the implicit persuasion process. The dopamine system is not fully developed until well into young adulthood and thus, adolescents may respond to engaging, rewarding marketing cues in a very different way from both younger children and adults. Pechmann et al. (2005)2 have already noted that brain change in adolescents results in thrill seeking and desire for immediate gratification which may render them particularly vulnerable to marketing and use of addictive products such as tobacco, alcohol and (arguably) high fat, high sugar food and drink. They also report that elevated levels of negative mood states, insecurity and self-consciousness may make high-status consumption symbols more irresistible for teenagers than younger children or adults. Taken in conjunction with our understanding of implicit persuasion and digital marketing, it seems that (contrary to the persuasion-knowledge model) children are certainly not protected from the unwanted persuasive effects of advertising by the time they reach high school. What we need most urgently is a serious program of empirical research to confirm that digital marketing techniques such as advergames, product placements, buzz campaigns, social networking skins, etc. (see Chester and Montgomery, 200834 for full list) do indeed persuade children without their conscious awareness. And in light of new evidence on the teenage brain we also need to ascertain differential age effects in young people from babies (cf Buckleitner, 200845 for evidence of 2 year olds exposed to digital marketing) to young adults. Such research will allow a much stronger case to be made about the realities of implicit persuasion in this specific context. Regulatory frameworks on both sides of the Atlantic also need to rethink the concept of "fair" marketing to children. They currently do not address the latest findings from neuroscience and tend to be based on Piagetian research conducted in the 1970s and 1980s in the context of TV advertising. The focus needs to shift from the age-related capabilities of the person targeted to the nature of marketing activities and contexts which trigger implicit processing. This is a profound shift as it will also have implications for marketing to adults. Moreover, the regulation of marketing to teenagers needs to be seriously overhauled. It can no longer be assumed that young people are "fair game" above the age of 12. This is an area which needs to be handled very sensitively as a new discourse of teenage protection may sit rather uneasily with discourses of respect and empowerment of adolescents. There is currently a great opportunity to influence the core thinking behind regulation as a great many changes are in process in response to both the obesity crisis and the rapid growth of digital marketing. In the UK, for example, the Advertising Standards Authority (ASA) is currently engaging in an open consultation on its two major codes (CAP and BCAP). Meanwhile, in Europe some of the challenges of digital marketing are being tackled. In October 2008 the European Advertising Standards Alliance (EASA, 2008) produced "Digital Marketing Communications Best Practice" guidelines for the self-regulatory organizations in Member States. This is a useful first step in establishing which digital activities should be classified as marketing communications at all. Importantly viral marketing and advergames are classified as such but it is still unclear what content on brand-owned websites will fall under the codes which relate to advertising in paid-for spaces. A key question, of course, is how these guidelines will be implemented across Europe. In the UK the Advertising Association-led Digital Marketing Group was due to report its findings in March, but has still not done so. There also appears to be some recognition by corporations that some marketing activities are less desirable than others. For example, the signatories to the Better Business Bureau Children's Food and Beverage Advertising Initiative in the USA and the EU Pledge specifically pledge to reduce the use of product placement, licensed characters and advergames in less healthy foods. However, this is a voluntary code and only applies to children under 12. In conclusion, rapid developments in neuroscience offer us much greater understanding of how contemporary marketing strategies persuade children and young people. However, current regulations are based on a view of advertising effects which is ill-equipped to address the effects of subconscious mechanisms such as implicit persuasion. 1. Friestad, M., & Wright, P. (2005) The next generation: Research for twenty-first century public policy on children and advertising," Journal of Public Policy and Marketing , 24(2), pp. 183-185. 2. Pechmann, C., Levine, L., Loughlin, S. And Leslie, F. "Impulsive and Self-Conscious: Adolesents' Vulnerability to Advertising and Promotion", Journal of Public Policy and Marketing , Vol. 24 (2) Fall, pp. 202-211. 3. Yurgelun-Todd, D. (2007) Emotional and cognitive changes during adolescence. Current Opinion in Neurobiology, 2, pp. 251257. 4. Steinberg, L. (2008) A social neuroscience perspective on adolescent risk-taking. Developmental Review, 28(1), pp. 78106. 5. Piaget, J. (1960), General Problems of the Psychological Development of the Child, in Discussions on Child Development: Proceedings of the World Health Organisation Study Group on Psychological Development of the Child IV , J.M. Tanner, and Elders, B. (Ed. ): NY International Universities Press. 6. John, D.R. (1999) Consumer Socialization of Children: A Retrospective Look at Twenty-Five Years of Research Journal of Consumer Research , 26(December), pp. 183-213. 7. Christenson, P.G. (1982) Children's perceptions of TV commercials and products: The effects of PSAs. Communication Research, 9(4), pp. 491-524. 8. Ross, R.P., Campbell, T., Wright, J.C., Huston, A.C., Rice, M.L., & Turk, P. (1984) When celebrities talk, children listen: An experimental analysis of children's responses to TV ads with celebrity endorsement. Journal of Applied Developmental Psychology 5, pp. 185-202. 10. Auty, S. & Lewis, C. (2004) Exploring children's choice: The reminder effect of product placement. Psychology & Marketing, 21(9), pp. 697-713. 11. Livingstone, S. & Helsper, E.J. (2006) Does advertising literacy mediate the effects of advertising on children? A critical examination of two linked research literatures in relation to obesity and food choice. Journal of Communication, 56, pp. 560-84. 12. Mallinckrodt, V. & Mizerski, R. (2007). The effects of playing an advergame on young children's perceptions, preferences, and requests. Journal of Advertising 36(2), pp. 87-100. 14. Heath, R.G., & Nairn, A. (2005) Measuring affective advertising: Implications of low attention processing on recall. Journal of Advertising Research . 45(2), pp. 269-281. 15. Heath, R., Brandt, D. & Nairn, A. (2006) Brand relationships: Strengthened by emotion, weakened by attention. Journal of Advertising Research, 46(4), pp. 410-419. 18. Stanley, D., Phelps, E. & Banaji, M. (2008) The neural basis of implicit attitudes. Current Directions in Psychological Science, 17(2), pp. 164170. 19. Phelps, E.A., O'Connor, K.J., Cunningham, W.A., Funayama, E.S., Gatenby, J.C., Gore, J.C. & Banaji, R. (2000) Performance on indirect measures of race evaluation predicts amygdala activation. Journal of Cognitive Neuroscience, 12(5), pp. 729738. 20. Richeson, J.A., Baird, A.A., Gordon, H.L., Heatherton, T.F., Wyland, C.L., Trawalter, S., & Shelton, J.N. (2003) An fMRI examination of the impact of interracial contact on executive function. Nature Neuroscience 6:1323-28. 21. Cunningham, W.A., Johnson, M.K., Raye, C.L., Gatenby, J.C., Gore, J.C. & Banaji, M.R. (2004) Separable neural components in the processing of black and white faces. Psychological Science, 15(12), pp. 806813. 22. Amodio, D.M., Devine, P.G. & Harmon-Jones, E. (2008) Individual differences in the regulation of intergroup bias: the role of conflict monitoring and neural signals for control. Journal of Personality and Social Psychology, 94(1), pp. 6074. 23.Gawronski, B., & Bodenhausen, G.V. (2006) Associative and propositional processes in evaluation: An integrative review of implicit and explicit attitude change. Psychological Bulletin, 132, pp. 692-731. 24.Strack, F., & Deutsch, R. (2004) Reflective and impulsive determinants of social behaviour. Personality and Social Psychology Review, 8, pp. 220-247. 25. Czyzewska, M. & Ginsburg, H.J. (2007) Explicit and implicit effects of anti-marijuana and anti-tobacco television advertisements, Addictive Behaviors, 32, pp. 114-127. 26. Gibson, B. (2008) Can evaluative conditioning change attitudes toward mature brands? New evidence from the Implicit Association Test. Journal of Consumer Research, 35 (June), pp. 178188. 27.Wright, P., Friestad, M., & Boush, D. (2005) The development of marketplace persuasion knowledge in children, adolescents and young adults. Journal of Public Policy and Marketing , 24(2), pp. 222-233. 29.Rossiter, J.R. & Robertson, T.S. (1974) Children's TV Commercials: Testing the Defenses. Journal of Communication, 24(Autumn), pp. 137-144. 31.Macklin, M.C (1987) Preschoolers' Understanding of the Informational Function of Television Advertising. Journal of Consumer Research, 14(September), pp. 229-239. 32.Moore, E. (2004), Children and the changing world of advertising. Journal of Business Ethics , 52 (2), pp.161-167. 33.Chester, J. And Montgomery, K (2007) Interactive food and beverage marketing: targeting children and youth in the digital age. Report from Berkeley Media Studies Group. 34. Chester, J. And Montgomery, K. (2008) Interactive food and beverage marketing: Targeting children and youth in the digital age. An update, Memo prepared for NPLAN/BMSG July 21 and 22. 37. Dovidio, J.F., Kawakami, K., Johnson, C., Johnson, B. & Howard, A. (1997) On the nature of prejudice: automatic and controlled processes. Journal of Experimental Social Psychology, 33(5), pp. 510540. 38. Payne, B.K. (2001) Prejudice and perception: the role of automatic and controlled processes in misperceiving a weapon. Journal of Personality and Social Psychology, 81(2), pp. 181192. 39. Payne, B. (2005) Conceptualizing control in social cognition: how executive functioning modulates the expression of automatic stereotyping. Journal of Personality and Social Psychology, 89(4), pp. 488503. 40. Govorun, O. and Payne, B.K. (2006) Ego-depletion and prejudice: separating automatic and controlled components. Social Cognition , 24 (2), pp. 111-136. 41. Rydell, R.J. & McConnell, A.R. (2006) Understanding implicit and explicit attitude change: a systems of reasoning analysis. Journal of Personality and Social Psychology, 91(6), pp. 9951008. 42.Casey, B.J, Tottenham, T.T., Liston, C., & Durston, S. (2005) Imaging the developing brain: What have we learned? Trends in Cognitive Sciences , 9(3), pp. 104-110. 43.Steinberg, L. (2004) Risk-taking in adolescence: What changes, and why? Annals of the New York Academy of Sciences , 1021, pp. 51-58. 44. Steinberg, L. (2007) Risk taking in adolescence: New perspectives from brain and behavioral science. Current Directions in Psychological Science, 16(2), pp. 55-59. 45Buckleitner, W. (2008), Like Taking Candy From a Baby: How Young Children Interact with Online Environments , New Jersey: Media Tech Foundation; New York: Consumer WebWatch.